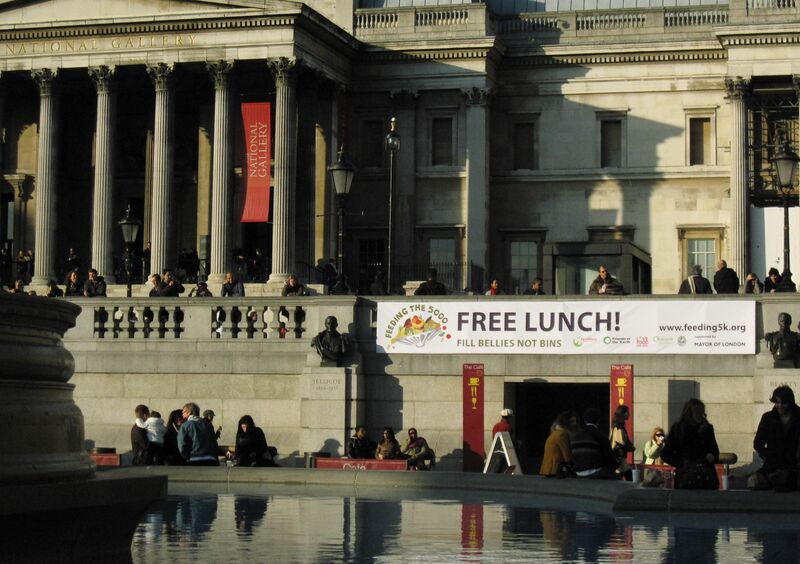 They say there is no such thing as a free lunch but the Feeding 5K event in Trafalgar Square on 18th November got pretty close! 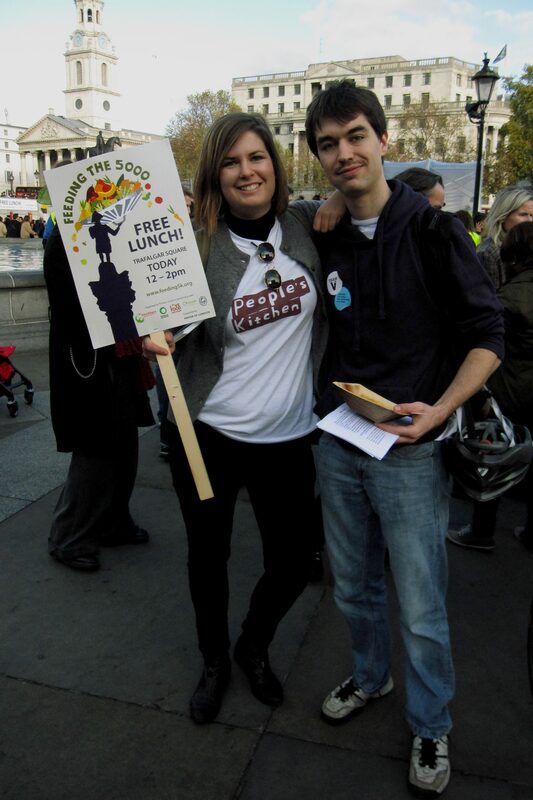 The very inspiring ‘Feed bellies, not bins’ banner created the perfect backdrop for the event. The event was organised by Tristram Stuart, (the author of the acclaimed book ‘Waste‘) to raise awareness and to promote the activities of the partner charities; FareShare, Love Food Hate Waste, Recycle for London, Friends of the Earth, FoodCycle and School Food Matters – using only ingredients that otherwise would have been wasted, the aim was to provide a free lunch for over 5000 people. Having seen plenty of posts about the event on Twitter, I had to go down to see what it was all about. It also helped that it was a beautiful, sunny afternoon which made it a lovely way to spend a lunch time. 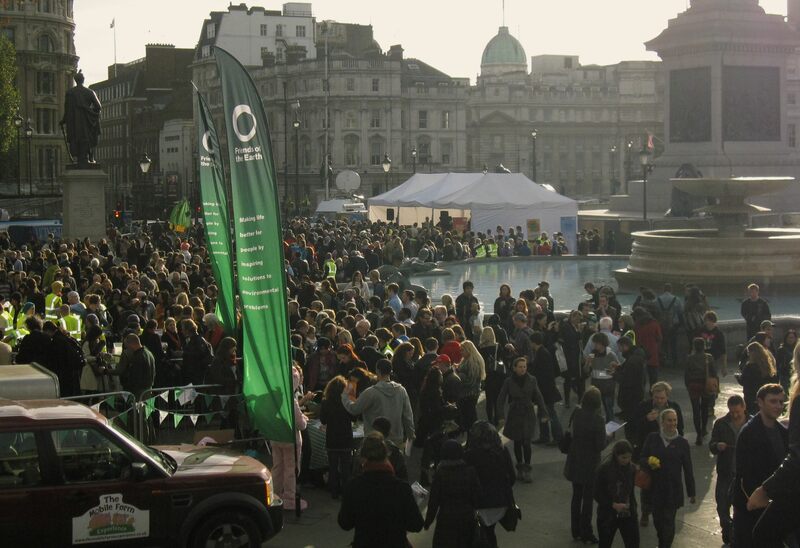 Trafalgar Square was buzzing. 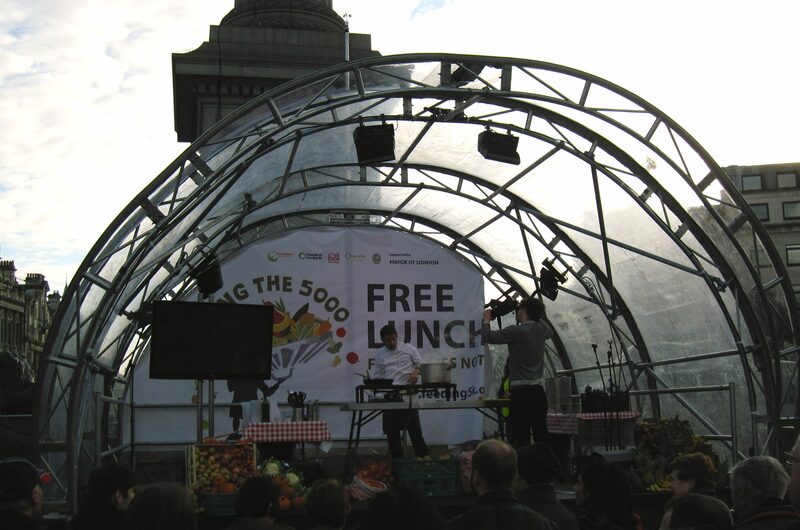 There were large stages where cooking demonstrations were taking place, there were boxes of vegetables being given out, there were animals to stroke and there was food to eat and drinks to enjoy. 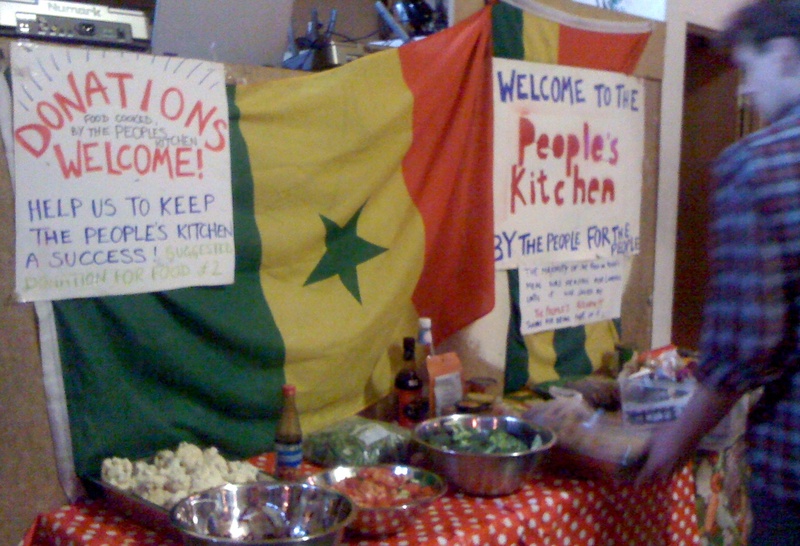 The food was delicious and the demonstrations very entertaining and informative. It was good to see a wide variety of food being cooked – soup, vegetable curry and pigs cheek were the few things I saw (and had the option to try). Although I’m a vegetarian it was good to see people being encouraged to cook pigs cheek to be a delicious food instead of it being discarded which is so often the case. 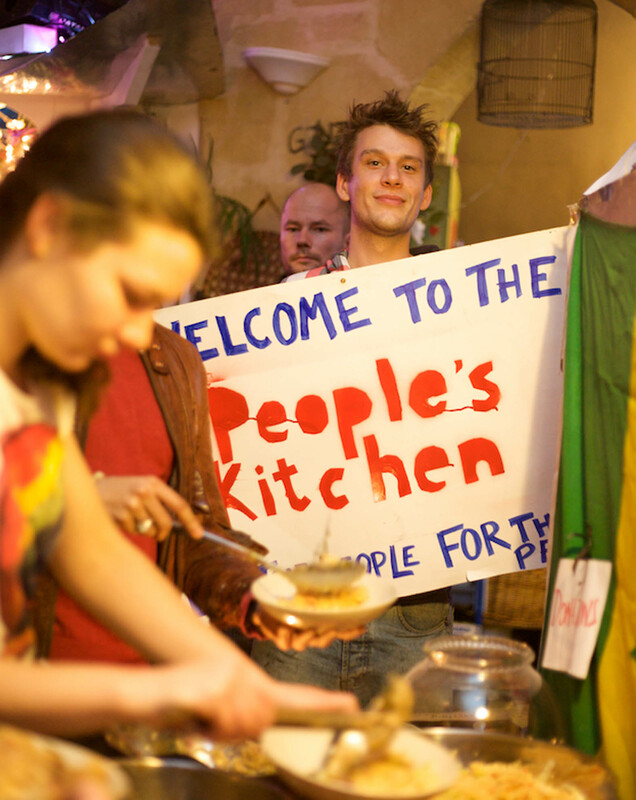 People need educating about food waste. The fact that an estimated 20 million tonnes of food wasted in Britain from the plough to the plate shows that we still do not understand the issue or do not know how to deal with it. 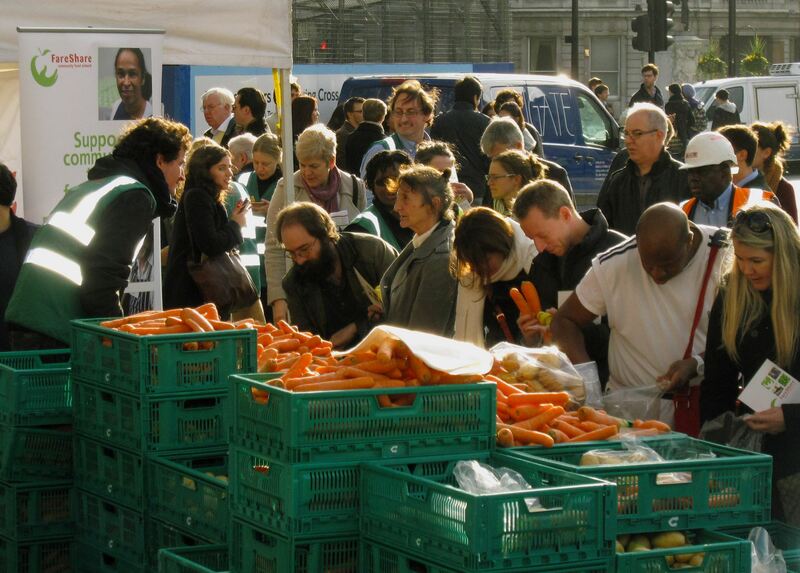 Supermarkets will not always accept fruit and vegetables unless they are perfectly formed, sell by dates are used which makes people throw food away before it’s actually too old to eat and people still buy more food than they need. Not only are there starving people in the world but the environment is being harmed by the CO2 emissions created when it is disposed of. There were boxes of ‘wonky’ carrots being given away, people making apple juice from excess apples and vegetable curry from a whole variety of delicious vegetables. My favourite part of the event was not only seeing many of The People’s Kitchen volunteers helping out but also a family who were walking around eating raw vegetables; the mother had a fennel in her mouth, one kid had a red pepper in her mouth and the other kid had a carrot in his mouth. That’s the attitude, I just wish I had captured the moment on camera! I left the event with a very full stomach and a pocket full of chillies….